[Stride]-Stride Step-[Choose one or more cards with the sum of their grades being 3 or greater from your hand, and discard them] Stride this card on your (VC) from face down. [ACT](VC)[1/Turn] Generation Break 2:[Counter Blast (1) & Soul Blast (1) & Choose a face down card from your G zone, and turn it face up] If you have a heart card with "Ranunculus" in its card name, choose one of your units, search your deck for up to one card with the same card name as that unit, call it to (RC), shuffle your deck, choose up to four units with the same card name as that unit, and they get [Power]+5000 for each face up card named "Dream-spinning Ranunculus, Ahsha" in your G zone until end of turn. If you have a unit with the same card name as this unit on your (RC), this unit gets [Critical]+1 until end of turn. Joint highest rarity card of this set, so is it worth it? This is another evolved form of Ahsha (made more explicit with the Ranunculus heart requirement), whose ACT skill costs 1 Counterblast, 1 Soulblast and a flipping of a face-down G-Unit. You then clone of your rear-guards of choice, then you choose up to 4 units you have with the same name as the cloned card, and then for every Dream Spinning Ranunculus face-up in your G-Zone, the chosen units gain 5k. And if you have a spare Grade 3 Ahsha on your rear-guard circle, the vanguard gains +1 Critical. Well I say that, something like Maiden of Flower Screen can just copy your Vanguard's name and it'll fulfill the same requirements. So assuming you wish to clone some non easily attacked target such as a booster, if you have an entire row worth of them after the cloning, you're giving each column 15k for the turn (that's assuming you played Dream Spinning Ahsha as the first Stride and paid the cost as well for both versions of Ahsha). Well, if we're doing that, then Jingle Flower Dragon is basically out of a job in this deck. As far as the feasibility of gaining an extra Critical goes, as I said, Maiden of Flower Screen got that licked more or less, or that new Ideal Maiden Thuria card, or just call Ahsha from your hand, mind the fixed field though. The extra Crit usually doesn't matter given the timing however. You're in it for the columns. With that in mind, 15k extra shield forced everywhere is a good finisher I guess, and thanks to Flower Screen and Thuria you don't necessarily need to set up the absolute perfect field first, which helps slightly in addressing Neo Nectar's weakness. I'd still rather take Spectral Blaster given that it's a bit more proactive, but this is a good card. So, we have... 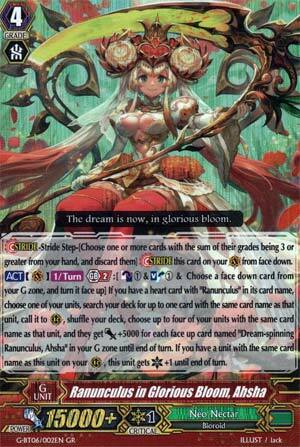 The evolved version of Dream-spinning Ranunculus, Ahsha? So, at GB2, you can CB1, SB1 and flip any unit in your G Zone face up to clone a unit up to four times and each one gets a +5000 power boost for every Dream-spinner face up in your G-Zone and there's a tacked on critical if you have the Grade 3 Ahsha as the heart. Hmm, not bad, annoying to play against unless you're running Link Joker, since this gets around Retire and Spin fairly easily. Can't complain, I guess. It's good, if you're running Ahsha, you'll probably want this. Best part is, you don't NEED to run four copies (though it doesn't hurt) to make this work well.